Why are retailers still not using web push notifications? One year ago we wrote about the arrival of web push notifications and their potential to help retailers target subscribers with relevant marketing messages. Time has passed, but little has changed. Web push notifications still have a lot of potential, but retailers just don’t seem to have embraced them yet. This blog post will tackle why that is, and take a look at what ecommerce marketers are missing out on in the process. Web push notifications (WPN) are pretty much exactly the same as app push notifications but on the web. And yet, whilst push notifications boost app engagement by 88%, the benefit of web push notifications is yet to be seen. Web push notifications offer those who visit a website the option to automatically receive updates from the company/publication/brand via their web browser by opting in. If you’re a fan of Vice News, you’ll know what we’re talking about. Web push notifications are also offered on Pinterest and - of course - Facebook (nothing worse than a friend liking your comment “I look so drunk” during a work presentation). And yet, despite their success with these tech giants, WPNs just aren’t taking off in the ecommerce sector. We spoke to Ometria’s chief technology officer, Alastair James and head of front-end development, Rui Ramos, to find out why this needs to change. According to Alastair and Rui, there are four big reasons why web push notifications have massive potential for ecommerce marketers. As pointed out by Kissmetrics, whilst app push notifications are limited to mobile devices and tablets, web push notifications also cover the likes of desktops and wearables. If your brand is on a budget, it’s also worth bearing in mind how cost-effective web push notifications are. Whilst apps can be expensive to build, web push notifications can be implemented at a much lower cost. Unlike subscribing to an ecommerce newsletter, opting-in to web push notifications requires minimal effort on the visitor’s behalf. No email address is needed, just the click of the “allow” button and hey presto. Whilst triggered email is a godsend, it tends to be carefully timed according to a visitor’s browsing and buying habits. Web push notifications, on the other hand, are as instant as they come. As soon as something relevant happens with a brand, a visitor will know about it - regardless of whether or not they are actually still on the site. The great thing about web push notifications is how direct they can be; if you manage to capture a consumer’s engagement, the exchange of information is quicker and more seamless than any other form of marketing communication. Linked to our second point, web push notifications are particularly useful when it comes to targeting consumers that are totally uninterested in email. There will always be a section of your customer base that either a) refuse to give their email address or b) refuse to ever open your emails. This makes retargeting hard. Web push notifications can be a good way around this, enabling you to send relevant messages to visitors without first having to worry about the open and click through rate. Now we’ve established the benefits of web push notifications, it’s time to consider why ecommerce marketers aren’t actually using them. Here, Al and Rui identify the biggest obstacles to WPN, and how those obstacles can be tackled. First off, some retailers still aren’t aware WPNs even exist; there has been little coverage on this form of marketing communication, potentially because implementing them isn’t an easy process. There are several different servers that offer web push notifications, including Apple, Google and Mozilla - all of which have different backend technology. As an ecommerce marketer, it’s advisable to use all three versions to target everybody - checking your Google Analytics should reveal the browsers used most (so you can prioritise accordingly). This is tricky to do single-handedly, and you’re likely to either need the support of a developer or have a platform do it for you. Solution: Luckily, there are services out there that are designed to help. This is because most platforms using WPNs tend to be news focused, and it’s easier to personalise news stories (a few a day) than a product catalogue with thousands of different products. For marketers, however, it’s a different story. It’s easy to fall into the trap of sending an abundance of push notifications that aren’t actually relevant - cue a sky-high unsubscribe rate. Solution: The solution to this is fairly obvious: make your web push notifications highly relevant. 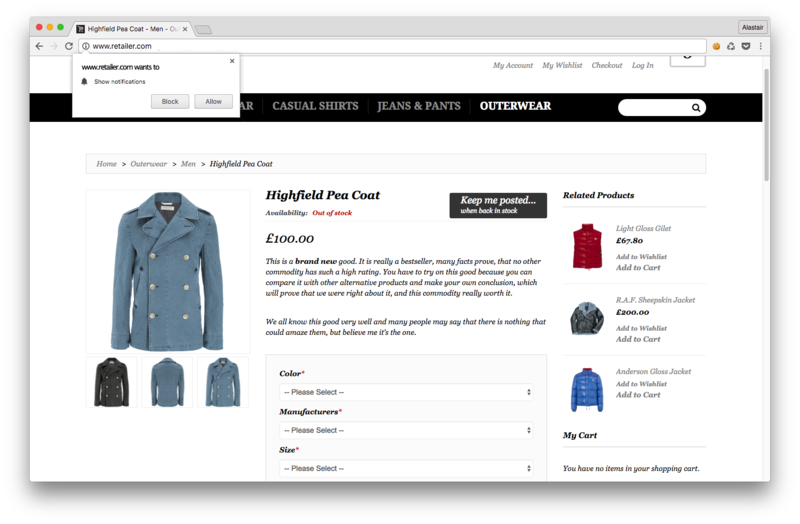 Making your notifications hyper personalised; for example: if a browser has been looking at specific items on your site, you can tailor the notifications sent to them around that category. Never overloading a user with a million messages. It’s important to remember that push notifications are much more obtrusive than emails, so any you send that are not applicable will just be perceived as an annoyance. What we’re trying to say here is that, in order for web push notifications in ecommerce to retail work, they need to be fine targeted and hyper personalised. This can be achieved by using an external platform, such as Ometria. Ultimately, to win at web push notifications, content and timing needs to be spot-on. Think about examples where it would really make sense to send a notification; for example, when a sale is about to start, or when an out of stock item has become available. To give you some inspiration, here’s a mockup of a product page featuring a button that offers to update a browser when something is back in stock. As an ecommerce marketer, if you want to see - first-hand - the benefits of this form of technology, then you need to be extra wary of not bombarding those opted-in with what could be considered spam. One way of making sure the messages you send are 100% relevant is to harness the single customer view. We harp on about this a lot, but rightly so. By knowing exactly where a consumer is in the customer journey, and what messages they are receiving on other marketing channels - such as social media or email - you can be certain that your web push notifications are not replicating any other marketing material and are genuinely helpful. Our advice, then, is to plan ahead. It’s pointless jumping the gun and offering visitors to your site web push notifications without really knowing what you’re going to send them. Incorporate web push notifications into your overall marketing strategy in order to see who needs what and when. After all, it’s not just about keeping subscribers happy, but giving visitors a good reason to opt-in in the first place.